Will the iPhone be the Universal Translator of the future? When watching Star Trek, I was always amazed that the aliens all spoke English. Writers explained this happy coincidence by the presence of a universal translator (UT), a portable device which could take any language and translate it into any other language as needed. Our nonfictional modern world has more than 20,000 different languages (if you include dialects) in its history. With the rise of globalization we desperately need an universal translator to help us speak to one another. Luckily, there are several different companies that are taking the first steps to creating an UT. 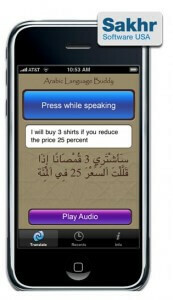 Sahkr and Jibbigo have developed iPhone Apps which transform the smart phone into a handheld speech to speech translator. Check out some of their demo videos after the break. Computer aided speech to speech translation isn’t easy. You need speech recognition, language analysis, machine translation, language generation, and speech synthesis. We’ve had limited handheld translators for some time. Devices like Voxtec‘s Phraselator allow you to select a range of sentences and have them translated into many different languages. We’ve also had more complex non-portable systems (like IBM’s MASTOR) which can do nearly full translation. But the products created by Sahkr and Jibbigo represent a new paradigm in speech to speech: commonly used hardware devices adapted solely through software. By integrating into an existing hardware platform, these next generation programs are taking us one step closer to having a universal translator that anyone can carry in their hands. Sahkr takes great pride in the realistic synthetic voices used for their translation software. I don’t speak MSA but the flow and tone of the translation is much better than I would have expected. The company press release also claims that their translations are ranked #1 by the US government. Users can even adjust the text of their translation (via keypad) to better communicate their words precisely before it is spoken. As you can imagine, this high quality comes at a high price. The software is for lease only (which isn’t that unusual for premium smart phone Apps) and the first month is $10. Subsequent months, however, can cost you either $50 or $150, depending on whether or not you qualify as an academic user. That’s no small change for the average user, but for the international business traveler it likely falls within budget. If you’re looking for a cheaper option, and you favor the iPhone over the BlackBerry, look no further than Jibbigo. Developed by Alex Waibel at Carnegie Mellon University, and released in October, Jibbigo does most everything that Shakr does, just in Spanish and only on the iPhone. You can edit via keypad, shake the iPhone to restart, and there’s even a back translation check. All that, and you make just one payment of $25. The difference in price between the two applications may reflect a relative scarcity of Arabic to English translators, but I’m guessing it also has to do with Shakr’s higher status as a translation service. Jibbigo is a fairly new company with hopes of expanding from Spanish and English into other major languages. Recently however, they had to deal with an audio glitch in their first released version (it’s fixed with an update). The tele-scouter projects texts and images directly into your peripheral vision and could easily be used as a speech to text translator. Of course, a portable UT doesn’t have to fit in your hand. NEC’s Tele Scouter is a head mounted optical display which projects words and images into your peripheral vision. Engineers claim that the use of the peripheral allows you to wear Tele Scouter for hours without headaches or other discomfort. 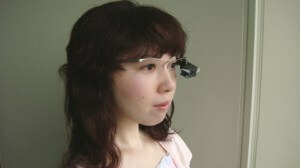 It is very light weight, and essentially looks like a small projector on a pair of glasses. A digital eyepiece reader is connected to a portable computer which interfaces with a remote server giving the user access to a local (or perhaps even global) network. Currently, NEC plans to market Tele Scouter as a means for engineering and technician teams to remotely share data and expertise in vivid detail. For a team of 30, the Tele Scouter system would cost around $8 million. NEC will launch in 2010 and hopes to sell 1000 such systems in three years. A trimmed down version of Tele Scouter may be adapted to serve as a universal translator. With rapid access to a remote server, the eyepiece has much more resources at its disposal than a smart phone and could serve to provide closed captioning during a conversation, as well as an augmented reality experience. There has been some buzz that NEC plans on following that route. Yet even if Tele Scouter stays a high-level engineering network tool, the concept behind a visual universal translator could be adapted into another system quite easily. Today, all it takes is a web browser and Google to translate text from one language to another. In fact, judging from our servers, many of you actively use Google to read this blog in a non-English language. It’s only a matter of time before someone combines a head mounted display, a mobile internet connection, and speech to text software to create a do-it-yourself UT. If you’re looking to start one of those DIY projects, you should do so quickly. As Shakr and Jibbigo find success in their Apps, we’re likely to see similar products spring up for many more languages. Eventually smart phones will become powerful enough to support translators that can identify and convert anything they hear. Many of the technologies we review on Singularity Hub are expected to take many years or even decades before they come to full fruition. Speech to speech hand held devices, however, are already here. Universal translators may appear much sooner than anyone believed possible. So get excited, Star Trek fans, the 23rd century is arriving early.